"You Hold the Ladder" Reviewed by RadioIndy.com! 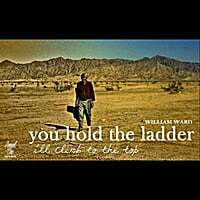 Musical artist, William Ward, serves up a beautiful Country single, “You Hold the Ladder.” This irresistible song has a soothing tonality as Ward sings with a warm and passionate style. His voice instills a peaceful tranquility as his emotive lyrics seep into your soul. You will find that this is a sweet and simple song that is genuine about its roots and sound. This single also has a charming acoustic appeal as the guitar, bass, and fiddle captures a soft and relaxing ambiance. If you like easy listening Country music then the wonderful single, “You Hold the Ladder,” is just the song to hear. You will want to hear more from this talented Country artist.